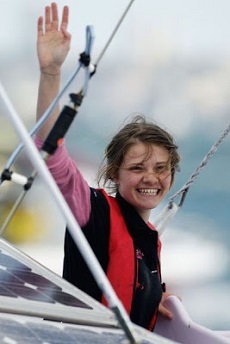 Today, 15 May, 2015 marks five years since Jessica stopped the nation and sailed back into Sydney Harbour, after 210 days at sea during her solo, non-stop and unassisted voyage around the world. Jessica still remembers the day clearly. It was a day that changed her life forever. Greeted by 1,600 support boats and an estimated 100,000 people lining the harbour foreshore, it was a day she will never forget. “Everyone asks me what I remember most about that day. It was all so surreal and a bit of a blur, as I hadn’t seen a person for 7 months. But there’s one moment I remember. When I switched on the TV in the hotel that evening, to see footage of myself sailing into Sydney Harbour. I remember watching it, as if it was someone else. I couldn’t believe it was me. The vision was just incredible and it was then that it sort of hit home,” said Jessica. It was an extraordinary day for everyone who witnessed it. It was just a magic moment. The girl with a fear of the ocean, a fear of water, who sailed 24,285 nautical miles around the world and overcame so much adversity to achieve her dream and inspire so many others around the world, who share the journey with her, via her blog. She survived the monstrous waves, fastened into a lap belt as an Atlantic Ocean storm drove her tiny pink vessel Ella’s Pink Lady upside down four times in one night. She learnt to feel wave patterns, hear wind changes; smelled the land as she neared the Australian coastline; how home had a distinct scent that made her spirit soar. Jessica is currently completing a communications and sociology degree while managing a diary of charity appearances, talks and sponsorship commitments. Jessica is also involved as a consultant in the development of the movie, TRUE SPIRIT, with the script now completed and a talented director, Sarah Spillane attached to it. Happy 5th anniversary Jessica and Pink Lady – thanks for the wonderful memories. Click here to view a video from her homecoming.